Salvation Jane: Echium plantagineum L.
Vipers bugloss: Echium vulgare L.
Growth Habit: Paterson’s curse starts off as a large, flat rosette of slightly hairy leaves with well marked veins. Flowering stems can grow to be 600-900 mm tall. These uncoil with new flowers at the tip and developing seeds protected by bristly husks further down the stem. Type of Plant: Herbaceous annual or short lived perennial. Flowers: Deep blue to purple, 20-30mm long with five petals fused into a trumpet shape. Fruit/Seed: Crinkled brown or grey seeds in groups of 4 around the stem protected by stiffly bristled husks. Seed may remain dormant in the soil for up to 6 years but most will germinate within two years. Dispersal: Roughened seed coats allow seed to adhere to wool, fur and clothing. Viable seed is passed by animals that have been feeding on the weed. Seed can be carried by water runoff. An important means of dispersal is contaminated hay and feed grain. Distribution: Paterson’s curse occurs in all agricultural areas of Tasmania in small scattered infestations. Commonly it is found around old home sites, poultry sheds and on road sides. New infestations in pasture have been linked to the feeding out of contaminated feed grain. Status: Paterson’s curse is a Declared Secondary Weed. This status is controversial as the Tasmanian situation has been static for many years. However, on the mainland this weed has become a major problem. 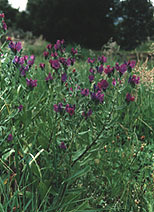 Once established Paterson’s curse can strongly compete with pasture species. Paterson’s curse contains an accumulative poison which may cause chronic liver damage to stock although they will usually avoid it if there is other green feed available. Can cause severe hay fever in some people. Although Paterson’s curse has the potential to be a really damaging weed, if outbreaks are spotted early, control and eradication can be achieved by using an integrated approach. Mechanical (all year). Grubbing and cutting are suitable for young plants as long as 20 to 40mm of taproot is removed. Flowering plants need to be burned or destroyed as the seed may still mature even after removal from soil. Grazing (all year). Heavy grazing is effective especially with sheep. However it needs to be carefully monitored as an over indulgence of the plant can cause liver damage. Heavily graze before the plants commence flowering. Control any flowering plants that escape grazing. Cultivation (autumn, winter and spring). Effective in arable areas especially if cropped with root or cereal species or followed by vigorous pasture. Bio-control. Several biocontrol agents are being trialed interstate, however none have been introduced to Tasmania. Herbicides (autumn and spring). Paterson’s Curse is best sprayed when young. Boom, spot and wiper application are all effective. MCPA, diflufenican, 2,4-D metsulfuron methyl, bromoxynil and glyphosate are registered in Tasmania.